Systems Dynamics is the discipline of taking feedbacks into account when evaluating organizations and systems (think vicious and virtuous cycles). Feedbacks, especially if delayed, have powerful but too often hidden effects on systems and decision making. Part of the visual representation of SD models is the use of "stocks" (think bathtubs) and "flows" (think water flowing in and out). Flows between stocks are controlled either by decisions or feedbacks within the system model. The visual representation aids considerably in reducing ambiguities and misunderstandings and even occasionally helps ferret out hidden agendas. We've found System Dynamics to be a very powerful method for thinking about healthcare systems and problems, but have generally made it a habit of hiding our approach. (As one prospective client told us once as they were turning us down after a long marketing effort: "this stuff is just too weird for us.") Instead, we've translated the results and simplified our description of the methods and it's generally worked out OK. However, this has meant that the clients have lost a lot of the potential power of the approach and even when they've embraced our work, they haven't prepared themselves for the next problem. It's a bit like the "wonks" and "hacks" divide that we've talked about before, understandable, but frustrating. We've found clients who make the effort and jump into SD benefit from doing so and it's both refreshing and promising when we see other organizations taking it on. Earlier this month, the CDC aired a satellite broadcast to update colleagues across the country on the progress of the Futures Initiative, with introductory remarks by Dr. Julie Gerberding, CDC Director. Featured prominently in Dr. Gerberding's remarks was a stock and flow structure with policy-driven flows (see below). 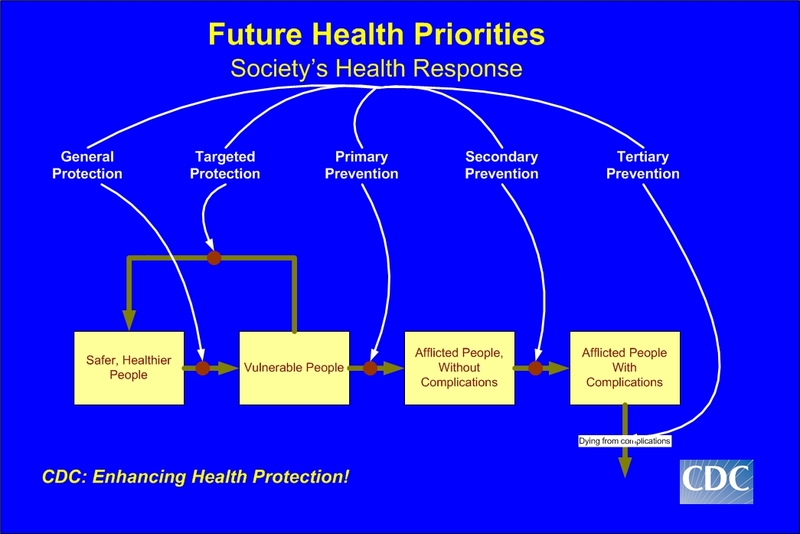 This seemingly simple graphic shows how society's health system is organized, and is being used at the CDC to help articulate a new mandate for the agency in the area of health protection. Although far more remains to be done to incorporate systems thinking and systems-based policy analysis at the CDC (next frontier: feedback loops! ), Jack & his colleagues believe this is an important step toward that end. Kudos to Jack, his colleagues, Dr. Gerberding and the CDC!